Add Powerful New Effects Enhancements! CreativEase is Pixelan's suite of POWERFUL video effects plugins that are EASY to learn and use... AND very AFFORDABLE! *Twelve effects plugins are available, organized into six Packs of effects plugins, as shown below. The video effects plugins include hundreds of adjustable film effects, blur effects, cartoon effects, time effects, motion effects, and more. CreativEase video effects plugins create fresh, unique visuals AND provide useful video effects capabilities for everyday video editing. * For CyberLink and Magix versions, it's $39 for four Packs: Color Effects, Blur Effects, Depth Effects, and Grain Effects. See below Pack information for details. • Adobe Premiere Pro/Elements version: Compatible with Windows versions of Premiere Pro (any CS version or CC Creative Cloud version) and Premiere Elements (any version). • Adobe After Effects version: Compatible with Windows versions of After Effects (any CS version or CC Creative Cloud version). • Sony Vegas Pro/Vegas Movie Studio version: Compatible with all versions of Sony Vegas/Vegas Pro (32-bit or 64-bit) and Vegas Movie Studio 6 or later. • CyberLink PowerDirector version: Compatible with PowerDirector 12 or later. 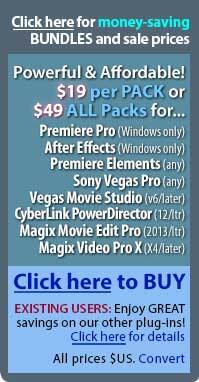 • Magix Movie Edit Pro/Video Pro X version: Compatible with Movie Edit Pro 18 or later and Video Pro X4 or later.